Complete Heavy-Duty Roll away Bed - Twin Size - 39" Wide -With 5" Thick Innerspring Mattress with taped and stitched edges. - Automatic Leg Opening - Extra-Large 5" Rubber Wheels - Rounded Corners, Firmly Braced. 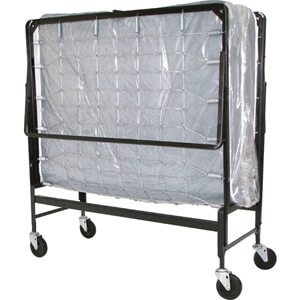 The industry's most comfortable and durable rollaway bed. Heavy duty angle steer rollaway bed designed for durability. Double strand link fabric with 12 gauge tight wound helical springs for proper mattress support. Manufactures Recommended Weight Capacity is 400 lbs. Mattress and Cover is FIRE RETARDANT - Tested meeting USA and California Laws. Technical Bulletin #117 for Flammability. Size Open: 39" x 75 In. x 20" High. Closed Dimension: 39" x 40" x 15"